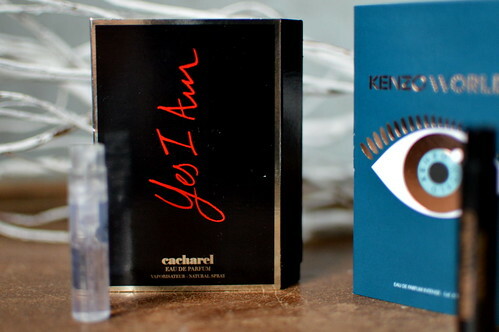 Recently I received two more fragrance samples: ‘Yes I am’ from Cacharel and ‘World’ from Kenzo. I tested them out and below you can read my first impressions. Would I buy a fullsize bottle or not? First impressions? When I had just put on this eau de toilette, my daughter immediately was sniffing around… she liked it very much. I was more like ‘ok, another one of those sweet and flowery smells’. It did last for a good couple of hours, it’s summery and it’s not that I dislike it, but it’s just not my kind of smell… so to me it’s more ‘no… I’m not’! To buy or not to buy? You guessed it right… won’t buy it! I even didn’t finish the sample (gave it to my daughter). Occasion? I wore this fragrance to go to work. First impressions? This eau de toilette is also quite sweet and flowery, but still it’s different from the Cacharel one. This one has some vanilla in it which makes it a bit fresher in my opinion. It lasts for a very long time (more than 12 hours) so that’s definitely a plus! To buy or not to buy? It is a bit too sweet to my tasting even though I liked the fragrance. Won’t buy a full bottle though, but I can imagine this is a scent that a lot of women will like. 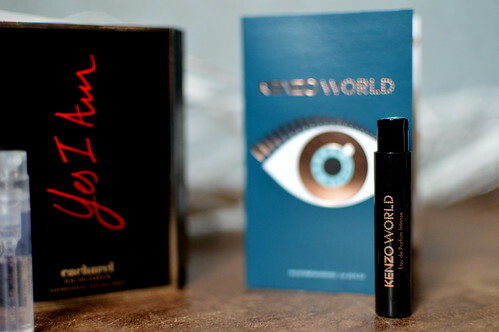 This entry was posted in Beauty, Fragrances, samples and tagged cacharel, eau de toilette, kenzo, perfume. Sample fragrances always attracts me as packaging is small & cute. I think this is a good way to try expensive perfumes before spending hefty amount.